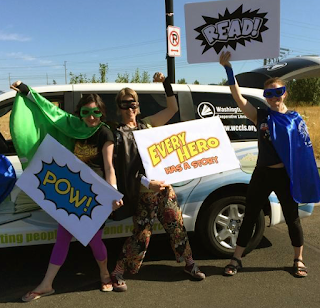 It could be a coincidence that “Be a Reading Hero” was a recent summer reading theme and local librarians became caped crusaders to inspired readers young and old. Perhaps, but this month many local librarians in Washington County have continued to take that hero role to heart and have come to the aid when vandals hit a fellow library in the rural southern Oregon community of Cave Junction. Hearing that colleagues and library patrons were in need was all it took for the staff from the Washington County Cooperative Library Services (WCCLS) and the WCCLS member libraries of Hillsboro, North Plains, Cedar Mill, Garden Home and West Slope to jump into action and pass the hat, collecting over $2,000 in support for the Illinois Valley branch of the Josephine Community Libraries. Donations came from library staff, volunteers, Friends of the Library and some city staff members. The donations will help cover necessary repairs and replacement of damaged items that are needed as a result of extensive vandalism. On the morning of February 23, robbers broke in to the Illinois Valley branch of the Josephine Community Libraries (JCLI), ransacking the building, and stealing cash and other items. Phone and Internet lines were cut and the fuse box destroyed. Windows were shattered and every drawer and cabinet was opened and items tossed about and vandalized. Even toys from the children’s area were thrown out on the lawn. A special collection of minerals and gemstones on display at the library were stolen. Thankfully no books, CDs, or DVDs were stolen, but a computer screen was damaged and an iPad was stolen. Although the library building is covered by insurance, JCLI still needs to cover the deductible and additional costs not covered by insurance. Replacement costs for damages and repairs are estimated at $5,000. Readers who also wish to lend support can donate to JCLI online at http://josephinelibrary.org or by mail to P.O. Box 1684, Grants Pass, OR 97528.